The season of giving is made all the more bright with our festive gift bag filled with holiday goodies. Nestled inside our durable jute tote are sugar-dusted spice cookies, slightly sweet with a hint of cinnamon to go with any holiday get-together. Enjoy them with coffee, tea or cocoa - a treat the whole family will enjoy! 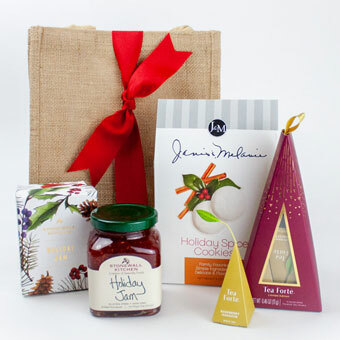 A hint of orange liqueur enhances the flavor of ripe pears, tart cranberries and sweet raspberries in Stonewall Kitchen's very special holiday jam - the perfect sweet spread for your Christmas morning table. And a selection of beautifully presented winter teas from Tea Forté celebrate the spirit and joy of the season while providing a warm, soothing cup of tea. J&M Foods - Holiday Spice Cookies: These sugar-dusted cookies are ideal to serve with coffee, tea or cocoa - a treat the whole family will enjoy! . 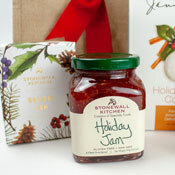 Stonewall Kitchen - Holiday Jam: A seasonal favorite with the aroma and flavor of the holidays from ripe pears, cranberries & raspberries with a hint of orange liqueur and spice. 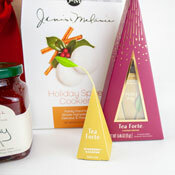 Tea Forté - Warming Joy Limited Edition Tea Tree: Seasonal blends of extraordinary holiday teas in flavors of Rum Raisin Biscotti, Sweet Orange Spice, Spiced Ginger Plum and Winter Chai. 4 Handcrafted Silken Tea Infusers, one of each flavor. Jute Tote Bag, 9" x 11" x 4"